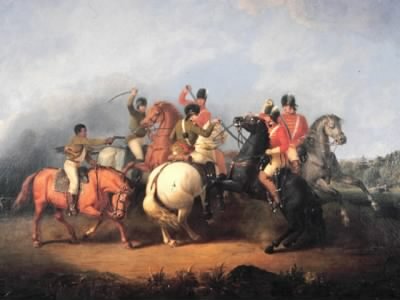 Nine months before the victory at Yorktown successfully ended what we now call the Revolutionary War, a critical turning point in the southern campaign occurred at the Battle of Cowpens in South Carolina. On January 17, 1781, General Daniel Morgan and his Continental forces met the British forces of Lt. Col. Banastre Tarleton. Strategic advantages were incorrectly assessed by Tarleton, orders were misunderstood among his troops, and the firepower of Morgan’s militia, coupled with a rewarding attack by Colonel William Washington’s cavalry, brought the Continental troops to victory. Within an hour of the battle’s start, chaos had ensued and Tarleton retreated. As Tarleton fled, he was chased by Colonel Washington, a second cousin of George Washington. Once Washington and his men caught up to Tarleton, hand-to-hand combat ensued. Washington’s bugler, an African American who remains unidentified, fired a pistol, essentially saving Washington’s life. At that point, Tarleton and his men fled to notify Cornwall of the defeat. According to the The Battle of Cowpens website, maintained by the National Park Service, the term cowpens is “endemic to South Carolina, referring to open-range stock grazing operations of the colonial period.” It was such a pasture where General Morgan encamped his troops on January 16, with forage for their horses. This field, known locally as “The Cowpens” was the site of the next day’s conflict and thus, a historic battle was named.